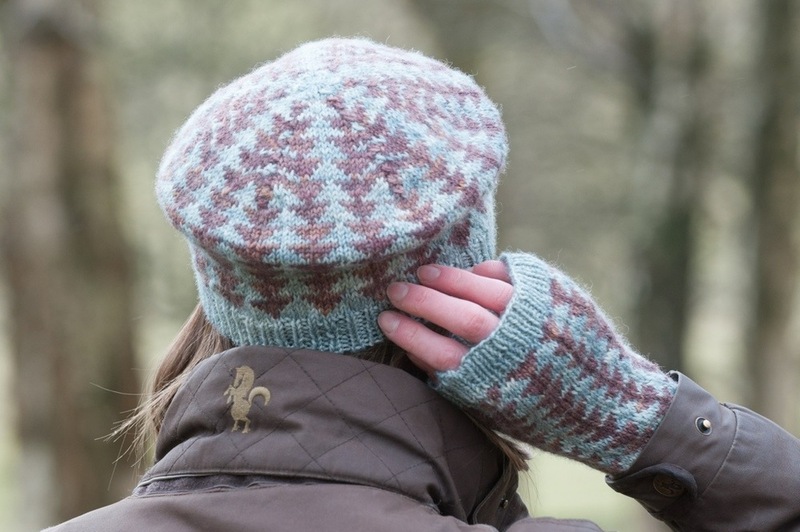 Woodville is my latest design and features a matching tam and fingerless mittens set. It has a simple repeating geometric pattern that is easy to follow, quick to make and fun to knit. I chose beautiful woodland shades for this set with the cuffs matching the main colour of the pattern. The yarn is Eden Cottage Bowland DK in Silver Birch (light green) and Dark Oak (brown). This yarn is one of my favourites and I always want to buy every colour they have when I see them at wool festivals. The colours are hand dyed and have a semi-solid appearance. The yarn is soft, has a slight sheen and works really well for this pattern. The best news is that it only takes 1 skein of each colour to make both the hat and mitts! Both patterns are fully charted and the simple stranded pattern is suitable for beginners who are wanting to give stranded knitting their first try. I love the way the hat pattern looks on the top, the pattern merges to form a star or a snowflake. The mitts have a ribbed cuff around the fingers, wrist and thumb and the hat has a ribbed edge too. The stranded pattern makes this set warm to wear and perfect for autumn and winter. My inspiration for this pattern comes from Elizabeth Woodville who was the wife of King Edward IV of England. She lived from 1437 to 1492 and reports say she was very beautiful and captured the young king's heart with an enchantment and used sorcery to help her cause in the War of the Roses. I have recently been watching the White Queen series on the BBC which is a drama based upon Philippa Gregory's The Cousins' War series of books. The 5 books that make up this series follow 5 different women during the War of the Roses and tells their stories. All the women are powerful in their own way and influence the events that take place around them despite having very few rights themselves. As a child I was fascinated by the story of the princes who disappeared from the tower after visiting the Tower of London and it was fun to read about the events and intrigue of the time. I'm very hopeful that King Richard III's body comes back to Yorkshire where he belongs. There is a fantastic little museum in York on Richard which is well worth a visit. Woodville Tam and Mitts set is released today and is available to buy here as individual items, or both together as an ebook.